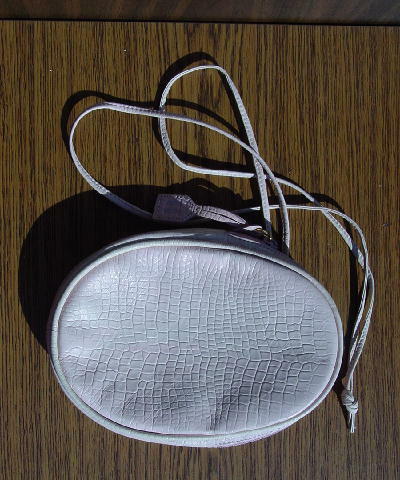 This vintage light pink oval purse has a reptile pattern and a vinyl off white lining with a pastel pink II all over and a gold-tone tag. There is a top pink zipper with a long pull and there are lighter areas on the surface, especially the back, which could be because of age, or it could have originally been that color. There is a long shoulder strap coming from the lighter back side. The shoulder strap is 50" and consists of 2 straps knotted together. A model wore this purse together with the Lejon belt.